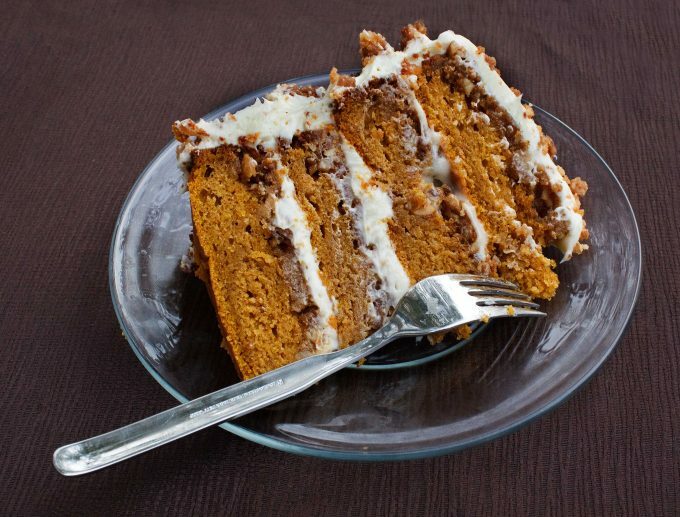 Home » Recipes » Dessert Recipes » Cakes » It’s The Great Pumpkin Crunch Cake Charlie Brown!! 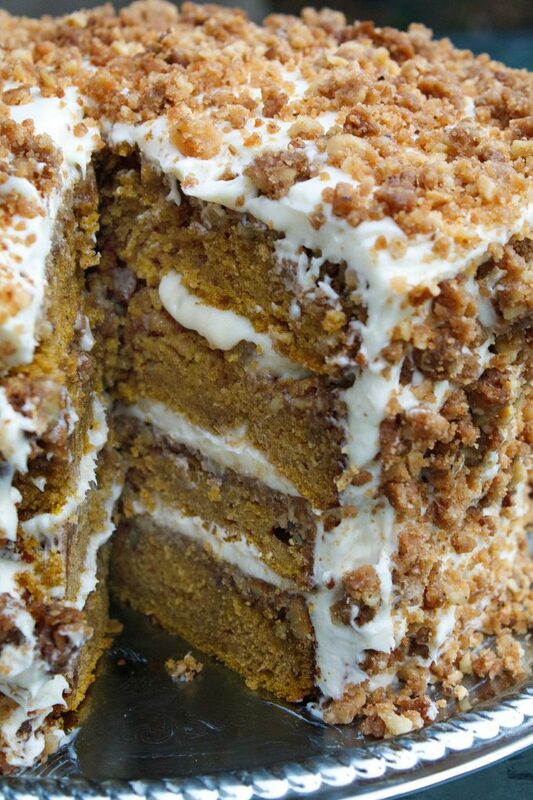 It’s the Great Pumpkin Crunch Cake, Charlie Brown! I first made My Pumpkin Crunch Cake back in the fall of 1999 for Lisa and my engagement party and it’s been a holiday standard ever since. When I first started blogging back in 2009, I had no idea where this delicious journey would take me and it was in the fall of 2010 when I first shared this magnificent cake with all my friends that follow my blog. This cake has been a huge success on the internet being made by countless bloggers and home cooks who have shared the deliciousness around the world, and as always I’m very happy to see it shared. 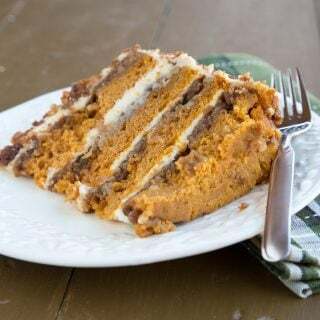 So I thought I would republish my Pumpkin Crunch Cake for all the friends and followers I’ve made since I first shared it on my blog…. I hope you enjoy it! It’s definitely that pumpkin time of year, everywhere I look I see my friends creating all of these wonderful Pumpkin treats, and the skies the limit! I am so proud to be part of this wonderful online community with so many creative, talented people sharing their recipes with us, and just when I thought I had seen it all, someone surprises me!! Life is good when you can learn something new every day! So, my friends that being said, I would like to share with you a cake that is sure to please. I have been making this since my restaurant days many years ago when I became the reluctant baker at a restaurant I worked at. It is adapted from my first baking book, Good Housekeeping Illustrated (it had pictures…lol). Whenever I make it, it becomes everyone’s instant favorite, I get requests for whole cakes, recipes, and even marriage proposals…lol….yes its just that good! So when you try it at home, be prepared to wow your family and friends! 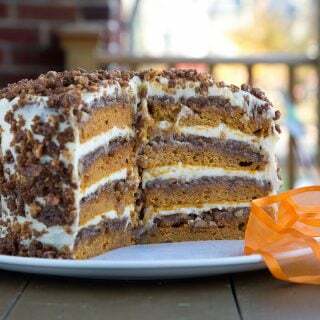 The Great Pumpkin Crunch cake fits in perfectly from October till December, after that you’ll just have to think of an excuse to make it, but whatever you do, just make it!! Now I always make this cake with 4 layers, it just looks spectacular with 4 layers, but feel free to cut it down to 3 layers. I also varied my normal cream cheese frosting by adding in some Mascarpone Cheese, you can use all cream cheese if you like. To cut this cake, I would advise using a serrated knife, the crunch topping is a little hard to cut through. I also make extra crunch topping to decorate the sides and tops with, to me, it covers up all my imperfections but feel free to leave it plain. 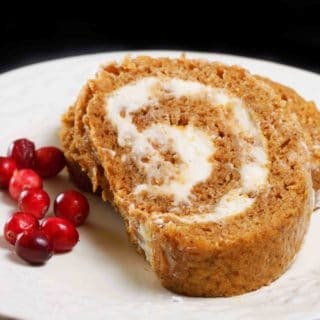 If you’re looking for more autumnal desserts I know you’ll love my Pumpkin Praline Cheesecake and Classic Pumpkin Roll. 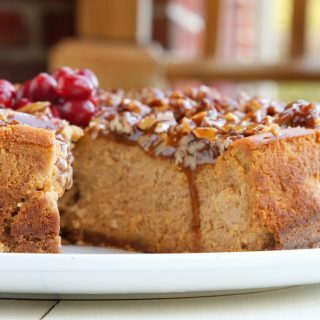 If you’ve tried my Pumpkin Crunch Cake recipe or any other recipe on askchefdennis.com please don’t forget to rate the recipe and let me know where you found it in the comments below, I love hearing from you! Divide mixture into 4 9-inch round Cake Pans, pressing into bottom and spreading it evenly into the cake pans. Reserve about 2 cups of the mixture which will be baked to use on the sides of the cake. In your mixer beat sugar and butter for about 5 minutes until light and fluffy, scraping down the bowl frequently. Add-In Pumpkin and all the rest of the ingredients, except the eggs. Mix just until blended. Bake in a 350-degree oven for about 20-25 minutes or until a toothpick inserted in the center comes out clean. If you use 2 racks to bake on in the oven, at the halfway mark rotate the pans Allow pans to cool about 10 minutes, then turn them out onto wire racks and allow to completely cool. After you have assembled all the layers with some frosting between them, start to spread the remaining frosting on the sides and top. When finished frosting, coat sides and top with your extra crunch mixture ( you can eliminate this step). I have made this many times and it always gets rave reviews. I have also made the crunch and added other cakes such as carrot. Definitely a ***** for me! Was going to make this and just realized i forgot the greek yogurt!!! Is it necessary for the cake or would i be making a mistake to try without! it is a very dense cake. I usually keep it refrigerated and its always better if I let the cake warm up a bit, but its hard to wait. I love the crunch topping which is why it found its way as a coating around the entire cake! Amazing delicious and fun cake to make, tomorrow will be my third time I made this cake. Now that is how you beef up a cake! This is an awesome dessert! I actually gasped when I saw this. I can’t wait to find a reason to make this! 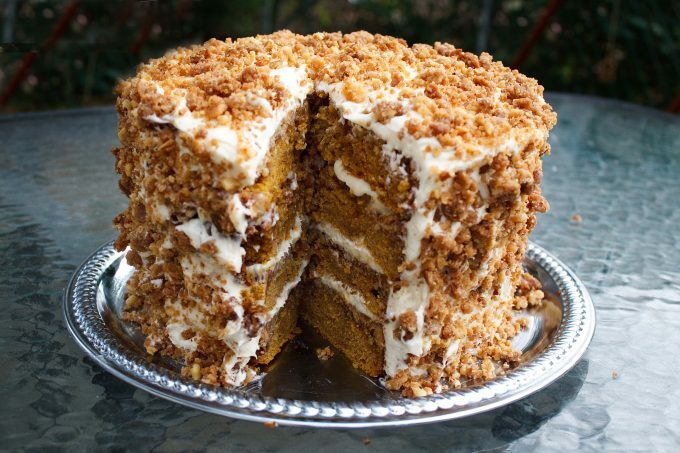 The Pumpkin Crunch Cake looks really legendary. Hope to get a slice someday too. It is fascinating to note that this was the start of your blogging. 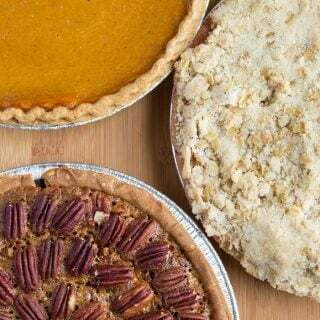 That slices of pumpkin pie makes me drool. I will definitely copying this recipe and make it this coming weekend. My family would be delighted I cant wait this is so good. My daughter love pumpkin pie and I love pumpkin cake. I wish I am good in baking, I don’t have the patience for it. Glad I was able to stumble over this. I think this is a good idea to include for our Halloween party. Let’s see how will it be and I hope they will like it. You had me at pumpkin…LOL!! This cake looks amazing and like something I could maybe pull off. HA! OMG, this looks amazing. I am a huge fan of pumpkin, so this is right up my alley. Bookmarked! I love the crunch you added to this! We were just talking about how we should make some pumpkin desserts well ahead of Thanksgiving. I think my kids would love this, it would be a fun fall treat. My son is Charlie Brown and it will be fun to share this cake with him. Because I bet you he will want it for his Birthday this year. This recipe looks so decadent. I can’t wait to give it a try. Huge fan of desserts with pumpkin in it. What an amazing looking cake, moist creamy and the pumpkin cake is popping and getting me so hungry. I am not a baker so i don’t know if i can create this but I wish I could. Wow. That looks amazing. I need to make this for our Thanksgiving dinner with our extended family. It would be a hit for sure! Oh my gosh this looks so good! I think I need this. I watch what I eat for something like this I will totally use it as my cheat day! I’m thinking this will be my daughter’s birthday cake. Her birthday is October 24 and I think she would love this! I wish I could jump through my screen right now! This is my kind of cake. It looks so moist and delicious and the cream cheese frosting (my very fave) looks amazing! This is my kind of cake! 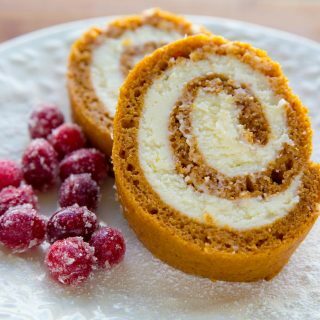 I just love pumpkin stuff, so I know I’d eat so much of this. I must try to make it soon! Great recipe! Delicious cake. I didn’t have vanilla wafers so I used Ritz crackers, and didn’t have any walnuts to add. But still turned out delicious. Also just used a basic cream cheese frosting and still was great. Thanks for the delicious recipe! Also, I made it just two layers in two 9×13 pans to make it stretch further. Thanks for the feedback Jen, and I’ve burned the topping before too. You get distracted and forget about it. I’m glad you hung in there and made it over because that is really what makes the cake so special! I’m happy to help you with your desserts and now you’re ready to try my chocolate mousse! I’m making this for my family for Thanksgiving. And I’m just wondering when you make the frosting are all the ingredients at room temperature? As well as the eggs? I’m assuming so, but you know what they say about assuming lol. Also I only have 2 cake pans but plan on doing the 4 cakes. When I’m dividing up the cake batter in the pans do you fill them quite full? That is just great – love the crunch topping! Is it time-consuming to make? It sure looks delicious! Thanks so much for letting me know that my cake was a hit Liz! I’m so happy to hear it came out well and everyone enjoyed it! Dennis, this looks aMAZing! Making it this weekend for my wife’s birthday and the family harvest party. Question though – does this recipe yield all 4 layers? Secondly, if I only use cream cheese, is that a total of 5 8-oz pkgs of cream cheese? What did you use to coat your cake pans for this recipe. I made this cake this weekend for my mother's birthday and it was a hit! This is definitely going into my fall baking rotation. yeah. This does look amazing. Why didn't you bring me some??? The frosting looks so delish! I love cake, it wouldn't take long for me to devour the whole thing! Thanks for sharing this with us. We share all the delicious walnut recipes and news with all of our walnut loving friends. We would love to have you join us and tell us all about your walnut love! Hope to speak with you and read your posts again soon. This looks amazing! Wow. Thanks for sharing! What an impressive stack of deliciousness! This is pretty much guaranteed to elicit oohs and aahs when sliced up, I am sure. I just gained about 10 pounds looking at this cake! Oh, mercy! This is the best use of pumpkin that I have seen yet! Thank you for posting this recipe. What size cake pans do you use? 8 or 9 inch or does it matter? thanks. This looks absolutely amazing! I will definitely be making this sometime this season. I just have to think up an excuse to make it! I can haz Pumpkin Cake! Chef Denis I can see why you would get marriage proposals from this cake. O-M-G I'm in pumpkin heaven. You are a fabulous cook AND a baker! I wish I had a piece of this incredible looking cake RIGHT NOW. With my coffee. Yes. It looks like it is a great recipe. You are the winner of my CSN give away. Could you send me your email so I could send you your prize. This looks absolutely delectable. I love the crunch topping, perhaps i'll throw on some toffee bits. I have found my Thanksgiving dessert! Thank you! Oh My! 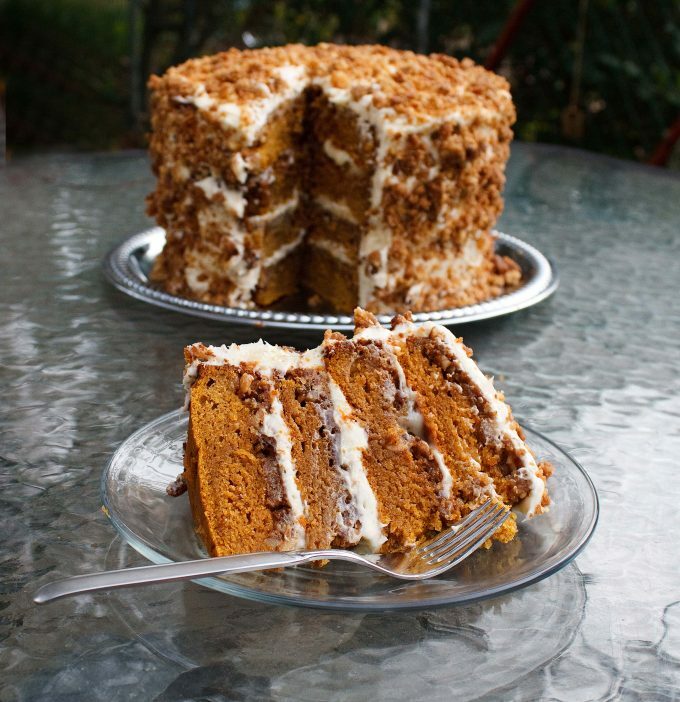 this pumpkin cake is just so beautiful! I imagine biting into the crunchy thing on the frosting… very, very tempting!! Dennis – this is beautiful, stunning, mouth watering. I cannot wait to try it this weekend. You are truly amazing and I love following your blog. layer after layer after layer of tastiness! what a truly terrific cake, dennis! Looks like a great cake for a party! I love marscapone and cream cheese frosting. So yummy! That looks so great! Love the crunchy bits. My daughter was asking for me to make a pumpkin cake this weekend… thanks to you, I will be making it. I might even make if for my hubby's birthday. Sounds perfect! Oh my!!! I am not a good cake maker, I just don't have the patience to make them look pretty, but this one is very much tempting me. I printed the recipe a day ago and have had it pinned to my board above my desk… just thinking! Beautiful Dennis! seriously Dennis, vanilla wafers?? YES, YES, and YES!!!!! best is that its got crunch factor too!!! Ooh, and congrats on being number 1 on The Top 9! You deserve it, Chef! Good thing I got down to #86 so at least I can congratulate you on being #1 for the Top 9 for October 26,2010. Let this be official! You mentioned about wowing our family with this cake, well Dennis, you certainly WOWED US…WOW! This is so spectacular, and amazingly delicious, I am at loss for more words…just simply mesmorized. Thank you for sharing your beautiful cake, and the source, as well! I have a feeling you've just managed to put this on everyone's to-do list for the season, including mine! This cake looks special, definitely fit for the holiday season. Can't wait to try it. Congrats on this very well deserved Top 9! A magnificent cake! I love the crunch topping! Awesome cake Chef! So happy to see it as Top 9 today! Well-deserved! Looks so amazingly delicious!! I want a slice right now! That cake is gorgeous! I love the layers and I love the variation with the marscarpone. I'll take a couple slices, one for each hip. p.s. thanks for your support Dennis! Means a lot. Well, well, well, looks like I picked a pumpkin of a day to drop by. That cake looks sinful! The four layers add to its Pumpkinification! Thank you so much for sharing, Dennis. Wow. This cake looks amazing. Beautiful job. A great thing about a three-layered cake is it serves a lot of people! This one is a fall gem, Dennis. Copying now…. This is definitely calling my name! I love pumpkin desserts more than anything and this cake looks absolutely stunning!